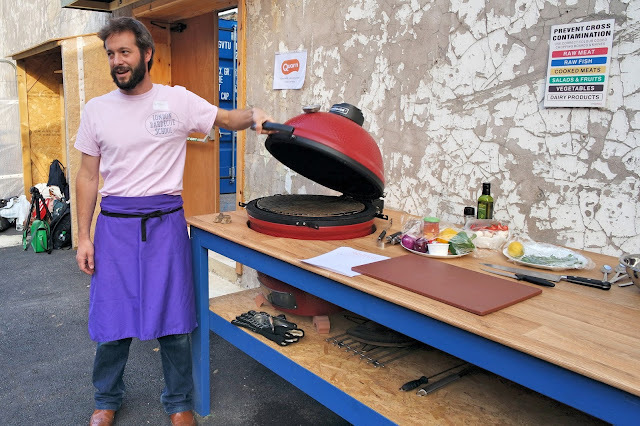 Hidden away behind Peckham Rye station, through a maze of outdoor food venues, bars and a rooftop cinema, you'll find the London Barbecue School. 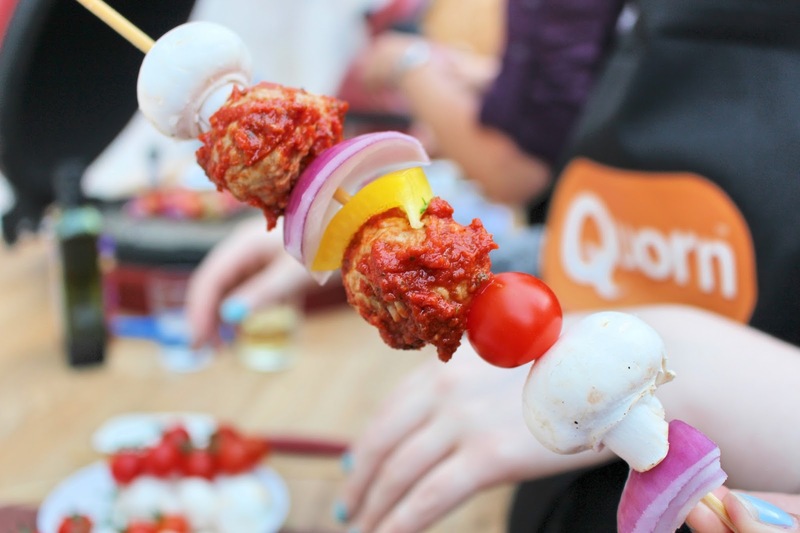 Host of this year's Quorn BBQ*, a chance to try some new recipes and products from their range. The school offers a series of classes and events to enable you to be king (or queen) or the BBQ. 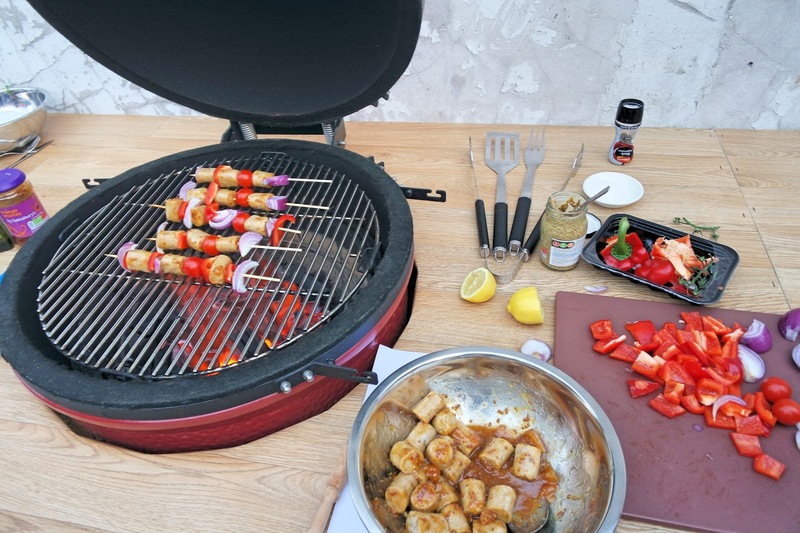 You can learn anything from how to use a ceramic BBQ, cooking paella or just classic BBQ skills. Once prepped with the how-to's, we set off into groups to make our recipes. First up, Swedish style meatball kebabs. Place the pesto, puree, 2 crushed garlic cloves, sugar and seasoning in a bowl. Add the Quorn balls and mix thoroughly to coat each evenly. Cover and leave in the fridge until needed. Make the dip by mixing together the yogurt, lemon juice, herbs, remaining garlic and seasoning. Cover and chill until required. Cut the peppers into 2.5 cm pieces and the onion into similar sized chunks. Thread the peppers onto skewers/kebab sticks alternating with the Quorn balls, onion, mushroom and tomatoes using 3 or 4 balls for each kebab. Place onto BBQ and cook for a few minutes each side. Alternatively, line a grill pan with oiled foil and grill for 10-15 minutes on a moderate heat whilst turning and regularly turning and brushing with any remaining marinade. 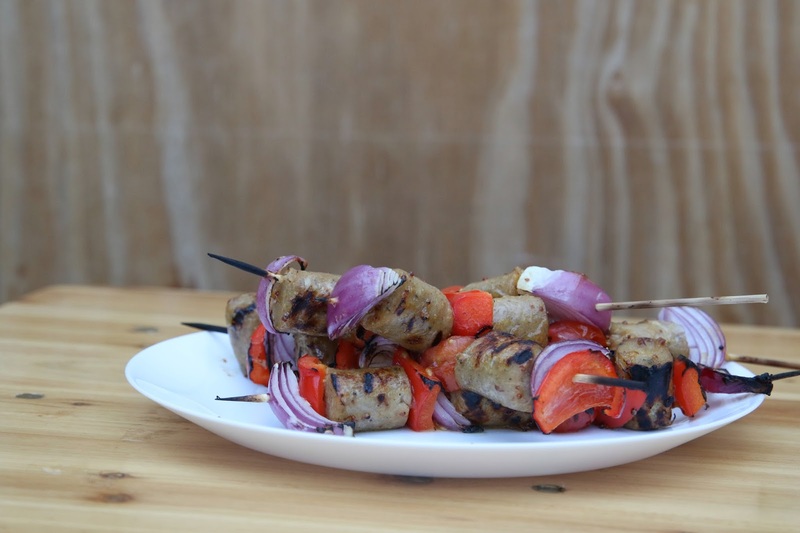 Next up, my favourite, sausage and vegetable sticky skewers. Mix the oil, lemon, mustard and mango chutney together in a bowl. Coat the sausages with the glaze, cut into bitesized pieces. Thread the onions onto kebab sticks/skewers alternating with the sausage, peppers and tomatoes. 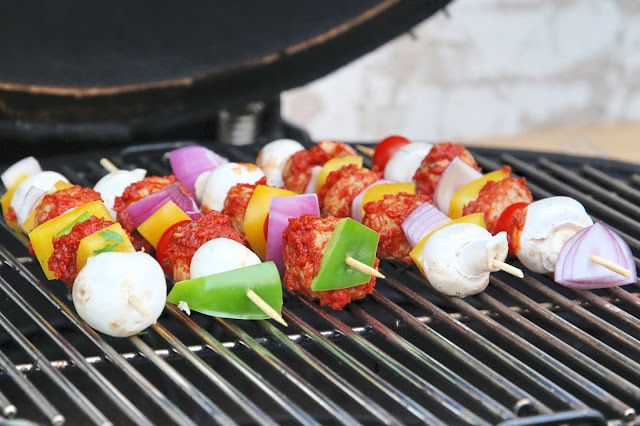 Place the skewers onto a BBQ and cook, turning frequently until the vegetables are cooked and sausages are piping hot throughout, brushing with any remaining glaze. They are equally good roasted in the oven 200c for 10-12 minutes. 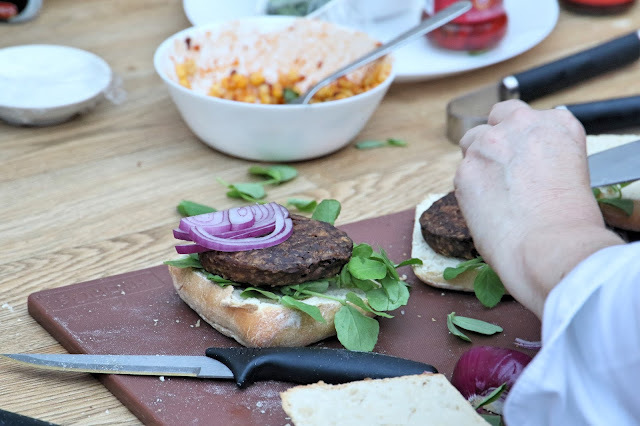 How about some chilli burgers with chipotle salsa? For the chipotle salsa, heat oil in a pan and cook the sweetcorn for 2-3 minutes, or until just starting to brown, stir in the chipotle paste. Cool then stir in the coriander and tip into a serving dish. Lightly brush the burgers with a tsp of oil and grill or BBQ for 8-10 minutes, turning frequently. Meanwhile, slice the ciabatta in half horizontally; brush the but side with the remaining oil and place on the BBQ or under the grill to toast. Place the pea shoots on the base of the bread, top with the Quorn burger and add some slices of onion. Finish with jalapeno peppers before seasoning with freshly ground black pepper. There's one recipe I didn't get a chance to make, southern fried chicken burger and roasted vegetable wrap. Using the Quorn meat free Southern burgers, some roasted peppers, courgettes and onion served in a wrap with yogurt dressing and some rocket leaves. It looked pretty tasty! I thoroughly enjoyed the evening of learning my way round a BBQ and trying out the recipes. I'll definitely be making these again at home as a healthier alternative to meat! It goes without saying, these recipes can all be made with actual meat...but if you've been thinking about trying Quorn, or even for ways to jazz it up, then have a go at these recipes. 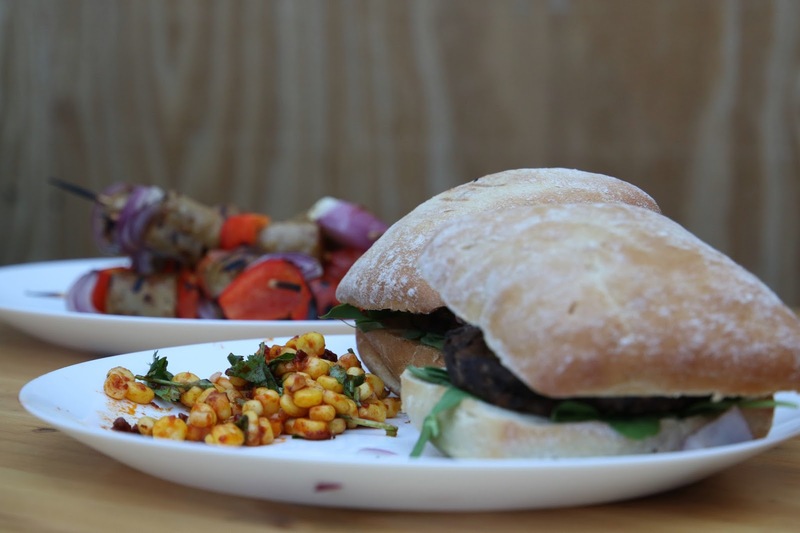 To find out more about Quorn's healthy protein and for some more recipes, take a look here. 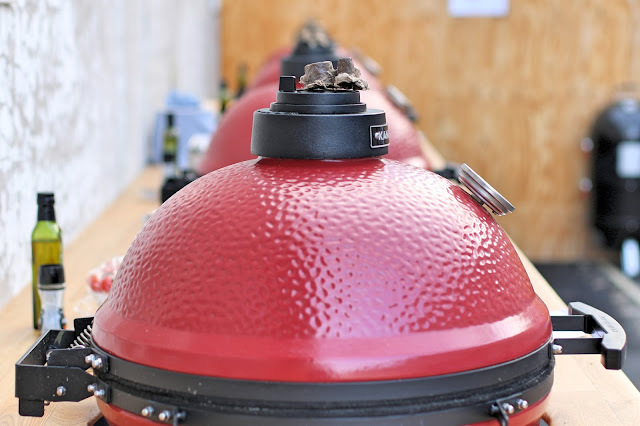 For more information on the London Barbecue School, take a shimmy on over here. Special thanks to Micaela from Reprise Media, Quorn & the BBQ school for having me and for teaching me some BBQ recipes to pass onto you readers. I hope you enjoy making them as much as I did! N.B, some images are my own and some are a fancy photographer's - allowing us to get hands on with the BBQs and have a drink or two!